One of my dear friend and customer asked me last week if there was anything wrong with my website because he was no longer getting recipes… I felt so bad!!! I know and I apologize to my dear readers for my lack of “posting”, but I have been so busy with parenting, giving cooking classes and other projects that I have not had time to post many recipes lately. Not to worry. I still cook and my recipes add up on my computer, and one day they will come again in your inbox;-) It is not so much the cooking or the writing that takes time, it is the proofreading and the editing that takes me a while.. Anyway, the other day I was fixing a corn dip for a friend of mine and the recipe was so yummy that I decided to adapt it to my dinner so i thought i would share with you today. 2 tbsp of butter or olive oil. First sauté the onion in the butter or the olive oil in a large saute pan. When the onion is becoming a light brown color, add the red bell pepper, scallions and jalapeno pepper. Stir and sauté for a few minutes. Then add the corn ( fresh or frozen). 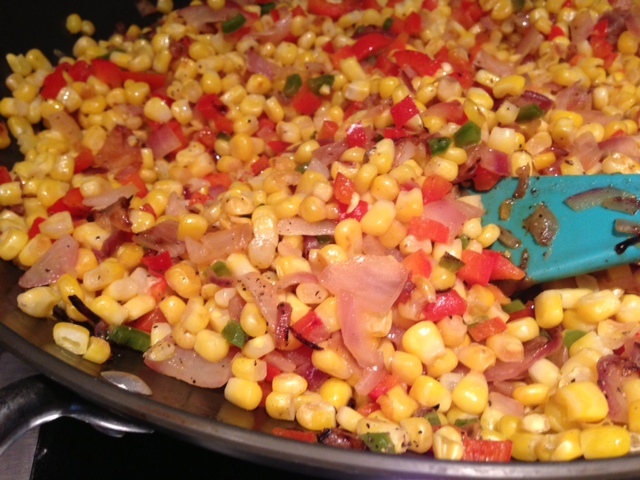 Cook this mixture on medium for a few minutes until the corn turns yellow and is cooked. Season with salt and pepper. Add a pinch or a dash of cayenne pepper depending on how hot you like your food and enjoy!! !